Only Undies, Gloves, and Socks Should Come in Pairs! At Q Antiques and Design, we believe a living space should reflect its inhabitant(s) and obviously, this extends to the dinner table. What better way to show your sense of style and provoke conversation — all while being good to the planet — than allowing us to design a mix and match collection of monogrammed knives, hand-painted plates and heavy highball glass you can cherish with use? Adopt and ENJOY examples of stellar workmanship long out of production. If something breaks, it's not a catastrophe (or just the sign of a truly great party...), but an excuse to add another treasure to your collection to be cherished and enjoyed all over again! While a collection of twelve place settings and accessories is ideal — especially for those who entertain with abandon — part of the fun can be designing and adding to your collection over time. A knock-out, personalized service for four is a great beginning and there is no time like the present! This blog entry is meant to inspire a revolt against unimaginative and matchy-matchy products offered by contemporary retailers. 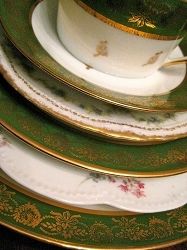 Our case study is a recently completed Limoges porcelain service and silver commission for style icon and diplomat, Mr. Bobby Richey, Jr. and the equally discerning Mr. Larry Allen.